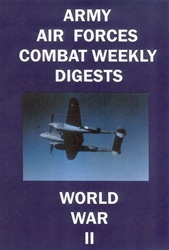 The Army Air Forces Combat Weekly Digests 1-10 WWII DVD contains (10) films of weekly air combat updates from the European, Pacific, and CBI Theaters as well as a P-38 training film and a B-17 film on the first mission over Europe. On two DVDs. Digests 1-5 are not narrated. 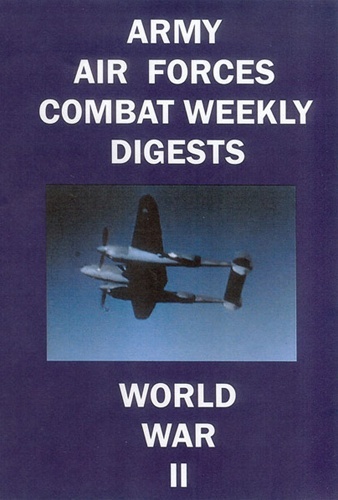 Film #1 - Combat Weekly Digest 1: 11 October 1943 - Italian flyers change sides., Raids on Wewak. Film #2 - Combat Weekly Digest 2: 18 October 1943 - Missions over enemy territory, Attu B-24 crash. Film #3 - Combat Weekly Digest 3: 25 October 1943 - Fighters down B-17., Japs bomb Kunming. Film #4 - Combat Weekly Digest 4: 1 November 1943 - B-17 Berlin Sleeper. First bombing Greece. Film #5 - Combat Weekly Digest 5: 8 November 1943 - Flak damage over Frankfurt, New turret trainer. Film #6 - Flight Characteristics of the P-38: 1943 - Color, 35 min. Film #7 - Combat Weekly Digest 6: 8 November 1943 - Land mine destroys Fortress. Attu arctic issue. Film #8 - Combat Weekly Digest 7: 22 November 1943 - Liberty ship rescue, Mission to Rabaul. Film #9 - Combat Weekly Digest 8: 3 December 1943 - Armistice Day Bougainville, Gun camera film. Film #10 - Combat Weekly Digest 9: 17 December 1943 - Bombing of Rangoon, First snow Aleutians. Film #11 - Combat Weekly Digest 10: 24 December 1943 - Bombing of Burma, Aleutians Christmas. Film #12 - Mission Accomplished - First B-17 Flying Fortress mission over Europe. 11 min. Total run time for Army Air Forces Combat Weekly Digests 1-10 WWII DVD is 3 hours, 41 minutes in B&W and color on two DVDs. Format is NTSC DVD.